Your bathroom is no doubt the most humid room in your house. While taking a warm, relaxing shower is a great way to chill after a long day, the increase in the humidity level creates the perfect environment for the growth of bacteria and mold. The best bathroom ventilation fan keeps your humidity levels in check by sending the moist air outside. Installing a reliable ventilation fan in your bathroom will improve the overall quality of indoor air. It also protects other parts of the house like the walls, paint, and furniture that are likely to suffer because of excessive humidity and moisture. Finding the perfect product that addresses your individual needs can be a little tricky. This is why we wrote this detailed buying guide to help you pick the right exhaust fan. The very same steamy water that can help you relax after an exhausting day can be the reason behind your agony. Excessive heat and moisture will make your paint crack, affect the shape of your cabins and mirrors, and cause expensive wallpaper to come off. That sounds scary, especially with all the money that has to be spent on repair and maintenance. But this chaos can be avoided if you have a good ventilation fan. 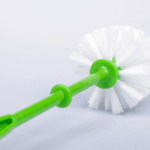 The following list sums up 10 of the best-selling products on the market that will decrease the humidity level in your bathroom and distribute the air evenly. 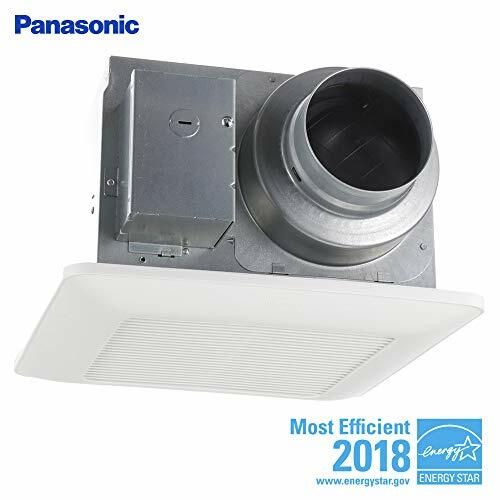 The first product on our list qualifies as one of the best Panasonic humidity sensing bathroom exhaust fans. Although bathroom fans tend to be noisy, this model is quite low at 3 sones. This guarantees a quiet and smooth operation during the day or at night. The fan comes in 3 different options based on the airflow to cater to individual needs. It is effortless to install thanks to its user-friendly design. This is an excellent ventilation fan that uses less energy so you can save on your electricity bill because it is Energy Star rated. This fan comes with a speed selector to pick the optimum airflow speed. The SmartFlow feature automatically adjusts the speed of the airflow once the fan senses an increase in the static energy. 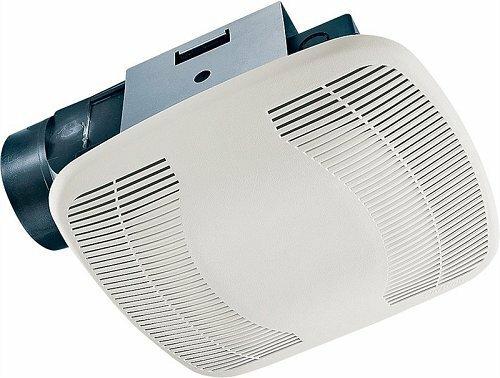 This optimizes the motor operation based on the humidity level in your bathroom or anywhere you choose to mount this fan. The motor also shuts off automatically if it gets too hot. The housing is made of galvanized steel, so it is designed to last in highly humid environments. The design prevents the cold air from entering your bathroom. Durable housing that can be easily mounted. Airflow speed selector and SmartFlow feature. Motor automatically shuts off to prevent overheating. This fan is relatively small compared to the other products on the list. However, it is a great choice if you are looking for a quiet bathroom exhaust fan at an affordable price. This compact model features a reliable sturdy motor that gets rid of warm, humid air with a light that indicates that your fan is working properly. It is designed to work for 70,000 hours of continuous use. The brushless motor guarantees flawless and quiet operation with low power consumption. At 2 sones, you can barely hear it. This is an excellent choice for small and family bathrooms because the motor housing is made of galvanized steel that doesn’t rust or corrode. You can choose to mount it to the wall or ceiling; however, the installment instructions can be a bit tricky, especially if this is the first time you do this on your own. This fan’s motor exceeds the Energy Star requirements, so it is an excellent value for the money. It improves the quality of the indoor air in your house and reduces the greenhouse effect. Affordable and compact exhaust fan. Brushless motor for quiet operation and low power consumption. Sturdy motor that lasts for long. 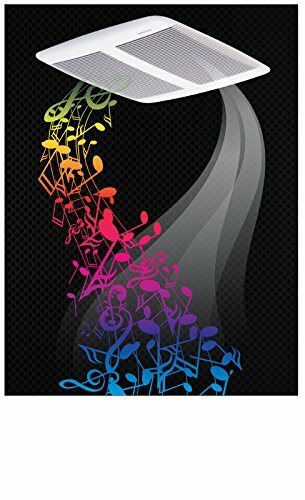 Can be mounted to the ceiling or wall. Exceeds the Energy Star requirements. This fantastic product will improve the indoor quality of the air in the bathroom as it creates the perfect relaxing atmosphere. It features high-quality speakers that allow you to play your favorite music by pairing with any Bluetooth device. The housing protects the motor of the fan and guarantees that the speakers will properly work as you chill in the tub at the end of the day. At 1 sone of noise level, we can safely say that this is a silent fan that won’t disturb you as it improves the quality of the air in your bathroom. It gets rid of humidity and bad odors to give you the chance to enjoy your long relaxing bath. The durable motor is continuously lubricated for maximum performance and continuous operation. It saves on the energy consumption as it an Energy Star product that will eliminate the humidity buildup. You can easily add light bulbs to customize your fan. It is super easy to mount. Powerful fan to get rid of moist air and bad odors. Lubricated motor that can work for a long time. Easy to mount and install. 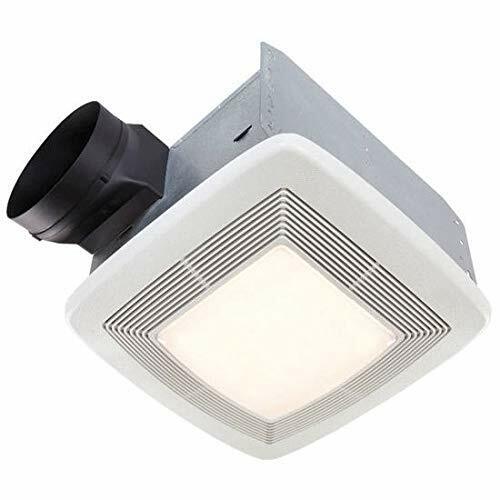 This product is a great value for the money because it features a reliable bathroom exhaust fan with LED light and heater. 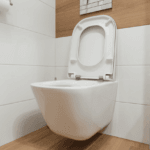 It is an excellent choice for small and medium-sized bathrooms as it expels the moist air to prevent the accumulation of moisture, humidity, and bad smells. It also warms up your bathroom which is an excellent option in cold weather. Although this 4-sones fan is a bit noisier than other models, it is a great choice if you need extra light in the shower room. Use the heater to heat your bathroom and turn on the fan to get rid of the humid air at a convenient speed. The heater evenly distributes the warm air while the motor gets rid of the moist air before it accumulates in the bathroom. Convenient combination of an exhaust fan, a heater, and an LED light. Suitable for small and medium-sized bathrooms. The heater heats the air and distributes it evenly in the bathroom. The motor gets rid of moist air and prevents its accumulation. 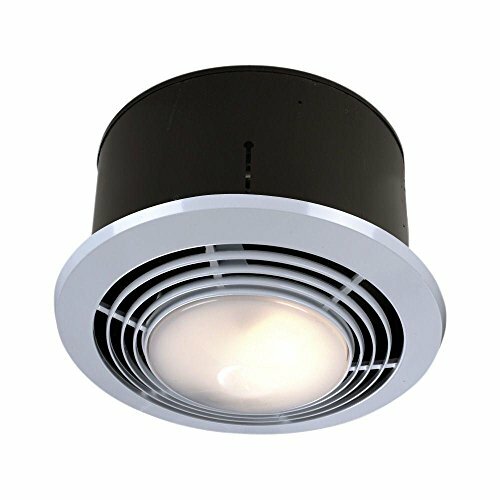 If you are looking for a modern bathroom exhaust fan with LED light, then you need to check this one out. 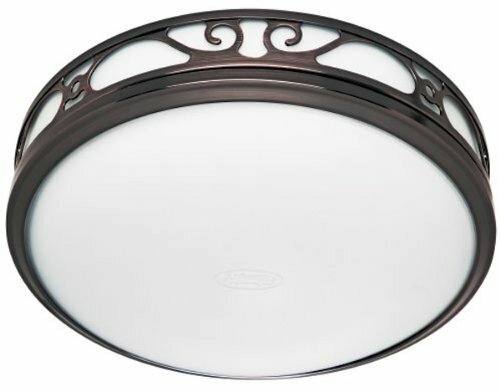 It features an elegant scrollwork design and bronze finish that complements the décor of your bathroom. At the same time, it circulates the air properly and gets rid of excessive moisture and bad odors. It is Energy Star compliant to save on the energy consumption. This fan is ETL damp-listed which means that it is safely used in damp and wet areas. You can install 2 bulbs to the glass enclosure with an optional nightlight for maximum convenience. However, the light emitted is not that strong due to the thick glass. This product gives you the option to wire the fan and the light together or separately to cater to your individual needs. 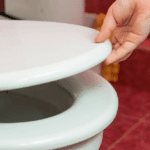 It is easy to install and clean thanks to the flushscrew-less design. The fan is not very quiet at 3 sones of noise level, but it gets rid of the damp air in the bathroom with no problems whatsoever. Convenient product with a built-in light. Gets rid of the damp air and bad odors. Specifically built for wet and damp places. This is another affordable bath fan that will maintain the quality of the air in your bathroom. The plastic housingdoesn’t rust or corrode over time. The snap-in installation allows you to install it in a few minutes without having to hire an expert. 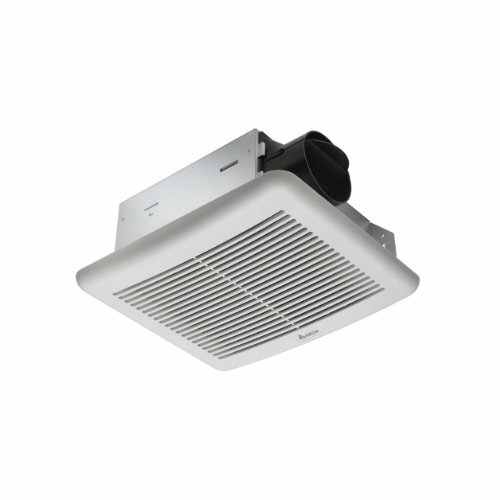 This exhaust fan is quiet and operates smoothly at 2.5 sones to expel the humid air at a convenient speed. The motor is strong enough to work continuously without overheating. 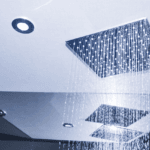 It is designed to be installed in the shower room or over the tub because the housing protects the motor from vapor. The backdraft damper protects the cold air from coming into your bathroom to maintain the quality of the indoor air. This fan comes with all the necessary parts that enable you to install it on your own. Durable plastic housing that protects the internal motor. 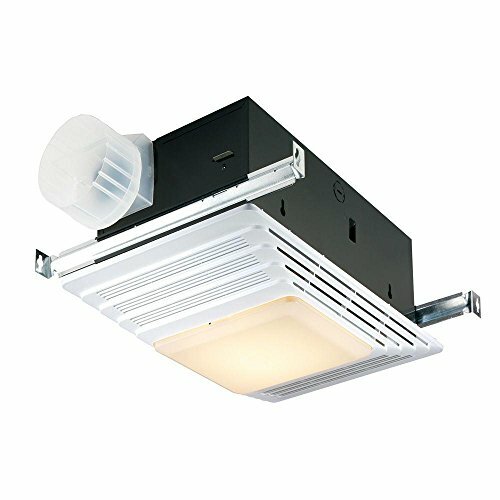 Are you looking for the best bathroom exhaust fan with light? This product can be the perfect choice for you. It is strong enough to expel the humid air from a 120 square feet bathroom to improve the quality of the air. Its design is ideal for positioning and mounting as it fits most ceiling joints. The fan operates quietly at 1.2 sones to get rid of the moisture buildup in your bathroom. The LED light and fan can be wired to the same switch or separate ones according to your preferences. The light is bright enough to work as a night light in your bathroom. Although this fan is easy to install, the instructions can be quite confusing. Convenient fan and LED combination. Expels humid air and gets rid of moisture. LED light and fan can be wired to work separately. Quiet operation for larger bathrooms. All quiet bathroom fan reviews show that this fan is a great choice. It features a modern and elegant design with high-quality performance that will get rid of the moist air and bad odors in your bathroom. It operates almost silently at 0.7 sones and doesn’t cause any disturbance as it expels the damp air. The motor is engineered for continuous use and complies with Energy Star requirements for energy-efficient performance. It can be safely installed in the shower room or over the tub because the housing doesn’t allow the moist air to affect the motor. This fan is probably the quietest model you can install in a big bathroom as it is as noisy as an operating fridge. The LED light adds a nice touch to your bathroom. The fan also features an optional night light. The flexible design allows for easy and fast installation. Powerful motor that gets rid of damp air and annoying odors. Complies with Energy Star requirements to save energy consumption. Built-in LED light with an optional night light. This is the right product to buy if you want to enjoy a relaxing warm bath with no moisture buildup. The heating element heats your bathroom while the exhaust fan gets rid of the humid air to protect your walls and mirrors. The fan features a reliable LED light with an optional night light for the perfect ambiance. This fan/heater combo is good enough for bathrooms up to 100 square feet. It is not as quiet as some of the other models on the market as it operates at 3.5 sones, but it won’t disturb you while relaxing in the bathtub. Although this product might seem a bit expensive, it saves you a lot of energy because you don’t have to use your heating or air conditioning systems separately. It can be easily mounted to help you improve the quality of air in the bathroom by getting rid of bad odors. This is a modern solution that comes with separate switches for each function. A fan/heater combo that works to improve the quality of indoor air. Built-in LED with an optional night light. This product is almost silent at 0.3 sones but works perfectly to get rid of the humid air that builds up in your bathroom and fogs the mirrors and windows. It comes with LED light and night light to illuminate your bathroom when you don’t want to use the power switch. The cost and energy-saving operation tempt people to install this fan in their bathrooms. It is easy to mount and will help you improve the quality of the air you breathe. The dual light mode guarantees that you can enjoy this product whether you like warm or daylight. The motor is designed to last for long as it works at low temperatures and prevents overheating. The galvanized steel housing protects the internal parts from exposure to moisture and heat. Sturdy motor for continuous operation. Quiet performance with cost and energy-saving operation. Durable galvanized steel housing to protect the internal motor parts. Why Do You Need to Buy Bathroom Ventilation Fan? 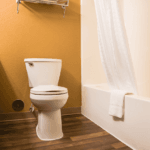 Water vapor accumulates when you use warm or hot water in the bathroom. This creates the perfect environment for the growth of mold and bacteria that can affect the health of your family in the long run. Bathroom ventilation fans prevent the moisture build up and allow you to breathe clean, fresh air. A good exhaust fan will get rid of the moisture that causes a bad smell in the bathroom. Since it is quite common to have a bad odor in the bathroom due to the use of the toilet, the fan will expel this air outside, providing you with clean and fresh air all the time. Foggy mirrors and windows are not pleasant to look at. A good fan will prevent the accumulation of fog keeping your mirrors and windows clean all the time. You will be using fewer cleaning products in the long run to maintain the condition of mirrors and windows. The dry fresh air is good for your health, but it will also protect your home. Excessive moisture can cause your wall paint to crack, peel, or change color. The doors and wooden windows might warp and become difficult to use. Mold and mildew infestation can damage your health as well as the walls in your house. Getting rid of moisture will protect the foundations of your house. 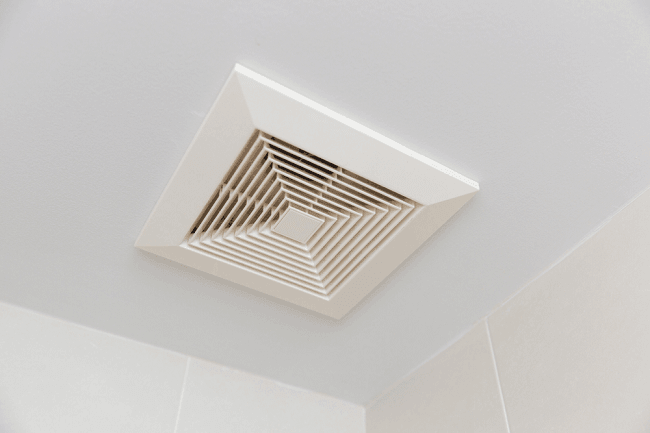 How to Choose the Best Bathroom Ventilation Fan? 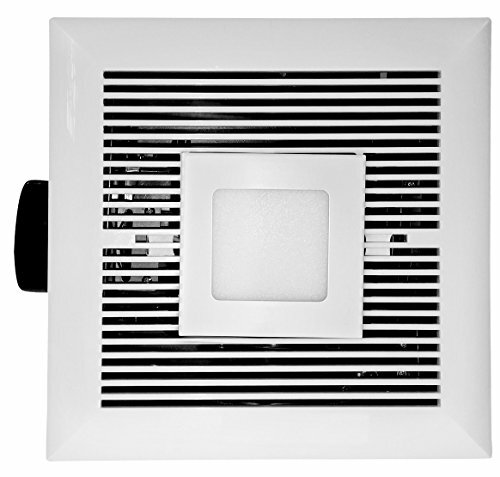 There are a lot of high-quality exhaust fans that you can install to the wall or ceiling of your bathroom. But each product has a set of distinctive features which can confuse you when you are shopping for a reliable fan. Here are some features that you need to take into consideration before you make a purchase. The power of the fan is measured in CFM which measures the amount of air expelled by the fan per minute. As a rule, you should buy a fan with a CFM that exceeds or is equal to the size of your bathroom in square feet. This guarantees that it will work properly to get rid of the moisture and humidity. The bigger the bathroom and the higher the ceiling, the more powerful the fan should be. You should also go for more power if you live with several people in the house or spend relatively long hours in the shower or tub. The noise level of bathroom fans is measured in sones. Some fans are not as quiet as the others. Noisy fans that work at 3 sones or more can be quite disturbing, especially if you use the fan at night. There are a lot of durable fans that are quiet and can work smoothly for long hours to get rid of the moist air in the bathroom. Whisper models that operate at less than 1 sone are great to use and won’t disturb you or your family even if the fan runs at night while everybody is sleeping. Some models come with a heating option that allows you to warm the air in a cold bathroom before you step in for a shower or a bath. These are great products that will combine 2 functions in a single model that you can use at home. They are perfect for people who live in a cold climate. This is another feature to consider when you are shopping for an exhaust fan. While simpler models that feature no light are more affordable, an LED light will help you create an elegant ambiance in your bathroom. Some fans come with a nightlight to enhance or substitute the lighting system in your bathroom. Some high-quality models come with a smart sensor. This sensor will switch the fan on when the humidity rises and automatically shuts it off when it is no longer needed. This guarantees that the fan will not work all the time. You won’t have to switch it on and off yourself. Shopping for home appliances is not easy because there are a lot of tempting options on the market. But it is important to remember that good quality should always be a priority. 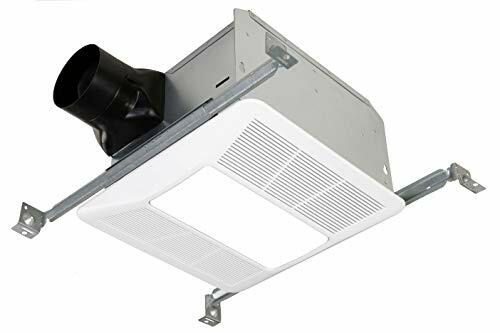 The best bathroom ventilation fan expels the humid and moist air, preventing the growth of mold and bacteria to keep your bathroom clean and healthy. Make sure that you buy a reliable model that will work for long hours to keep your bathroom clean and dry.